Why we think this Boston conference is still a top pick for any writer. 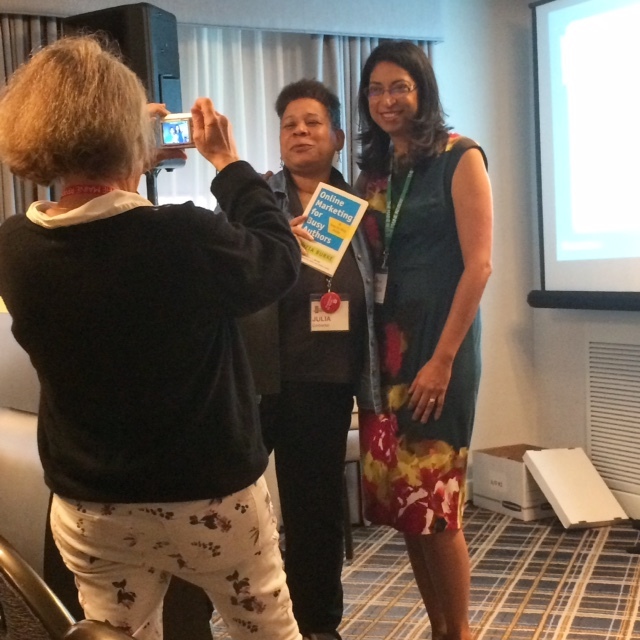 Author Fauzia Burke poses with Muse attendees. We’re back in the office after a long writerly weekend at the Muse and the Marketplace, one of the premiere writing conferences in the U.S. – so premiere, in fact, that it topped our list of the best writing conferences in North America. An emphasis on participation and learning, not lecturing. Look, we love attending panels as much as the next scribe, but after an hour of hearing panelists talk…and talk…and talk…, we’re more than ready for an hour-long lunch break. The Muse takes more of a classroom approach: Each session is taught by roughly one to three experts, and presenters are encouraged to make their sessions as interactive as possible. Over the weekend, we were asked to read excerpts aloud, brainstorm as a group, complete writing exercises, and – in some cases – arrive to a session with our drafts in hand. This audience-driven model creates sessions that fly by instead of dragging on and on. Real talk from leading experts in the field. We’re writers: We love philosophical talks on the writerly life as much as we love Moleskine notebooks and independent coffeeshops. And believe us, the Muse offers plenty of space for musings (pun intended) on our purpose, beliefs, and ideals as writers. But if we’re ponying up steep costs for registration fees, we generally want to walk away with hard-and-fast tips and clear takeaway. We need facts, processes, and real know-how that we can apply to our careers the minute we get home. The Muse realizes this, and its sessions tend to be much more concrete than abstract: One session showed off new sites and products to make social media marketing easier, for example; Hannah Tinti led another that offered writers a clear, step-by-step method for identifying holes in their story structure. In short, writers don’t just leave with confidence and inspiration: They leave with real tools and processes to help them succeed in the future. How’d you like to have real, personalized feedback on your book from the publishing industry? One appointment at the Manuscript Mart will net you a 20-minute, one-on-one session with an agent or editor. These industry professionals will have read your work in advance and will come prepared to deliver direct feedback on your manuscript. No, not every Marketplace meeting ends in a book deal, but every single one does allow a writer to gain real advice from experts who know the business of writing – and, yes, many an agent has signed a client based on their Manuscript Mart consultation. “Tracks” that help writers sort out the noise. A writing conference is only as good as the quality and variety of its workshops. But Lord does sorting out a dozen panels each hour get tiring. Enter the Muse & the Marketplace recommended session “tracks:” Simply click on your specialty or goal (Craft of Literary Fiction, Children & Young Adult Writing and Publishing, Agent-Seeker Track, Publicity & Promotion for Writers, etc.) and you’ll see a wealth of suggested sessions aimed at meeting your needs. The Muse also includes a phenomenal “Writers of Color” track that includes sessions like “Race and the Situation of the Writer in 2017” and an “Agents and Editors of Color Roundtable” session, which was so popular in 2017 that it was standing room only, with attendees spilling out the door. The Muse offers discounts for writers under 35, first-time attendees, people of color, and writers coming from out of state. Would-be attendees can also apply for a scholarship, including assistance for non-New England writers, writers of color, or writers with disabilities. Overall, the Muse & the Marketplace combines an extremely high level of talent (both in attendees and presenters), practical and interactive learning sessions, a wealth of publishing opportunities, and a wonderful literary location. If you attended the Muse this year, what was your favorite session? There were great sessions; as a nonfiction writer I particularly liked Calvin Hennick and Jessica Papin’s presentations. But the best part is that the participants — attendees and authors — were all sociable and approachable. Met Celeste Ng, Annie Hartnett and Amy Jo Burns among others and can’t wait to read their books. This sounds like a fantastic opportunity, and I’ll definitely have to check it out in the future. One small edit to the article, if I may: in the second “paragraph” above that starts “What makes this conference so unique?”, please take out the word “so.” The word “unique” is all or nothing. It doesn’t have gradations, which is what the word “so” implies. Thanks so much for the information on the Muse and the Marketplace!